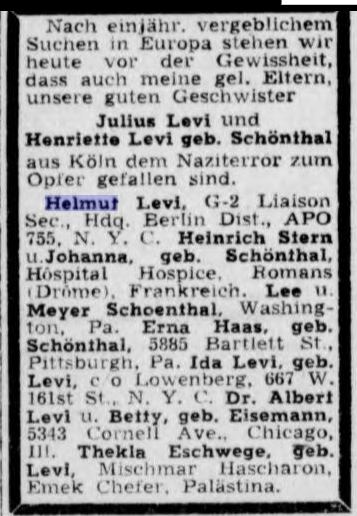 This entry was posted in Genealogy, Germany, Holocaust, Pennsylvania, Pittsburgh, Schoenthal, Washington PA and tagged Corpus Christi, Darmstadt, Germany, holocaust, schoenthal, Texas, US Army, US Navy, World War II by Amy. Bookmark the permalink. 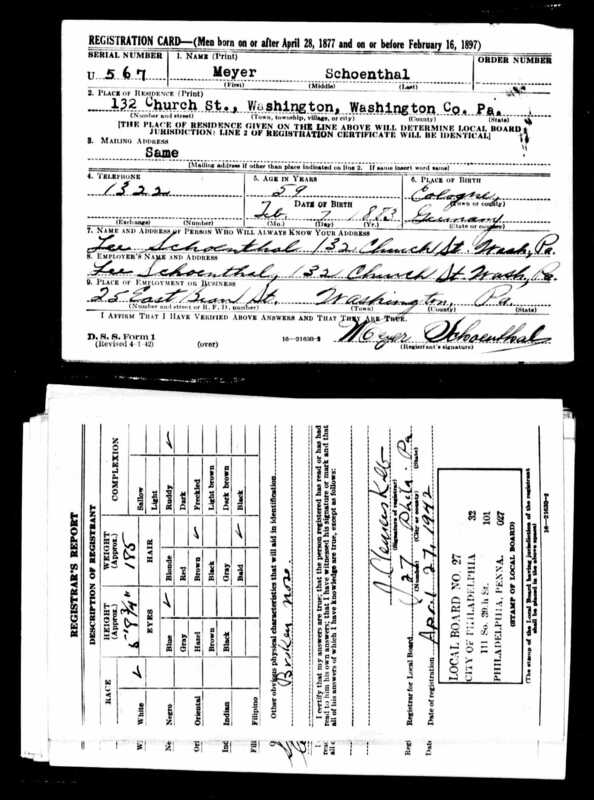 The WWII draft cards which are available to the public are often called the “old man’s registration” as it was a registration of men between 45 and 64 years and who were not in the military. 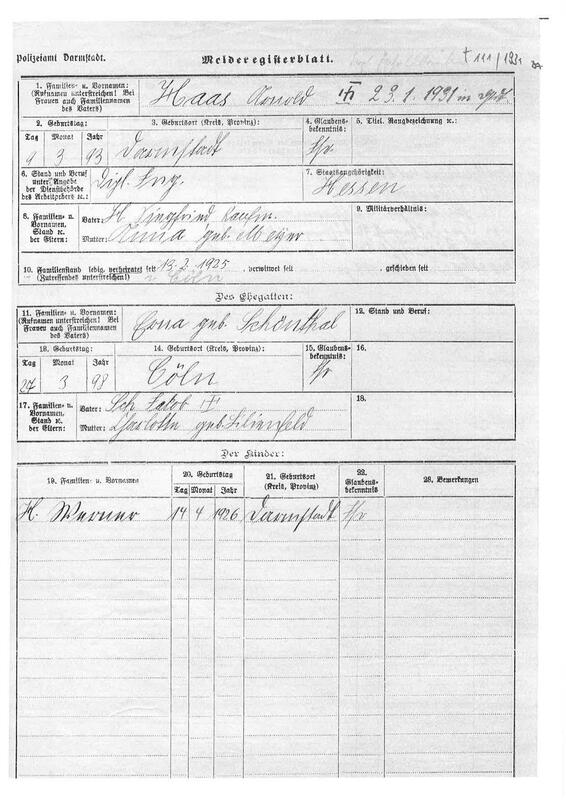 Conducted in 1942 it is often annoying to find a relative was born before 28 April 1877 or after 16 February 1897 and was “missed.” Only when re-reading the description did I learn that this was the 4th registration and the others are not available due to privacy laws. Helmut Levi’s letter to the Yank was a special find. He had very strong feelings. I wonder when the draft registrations for the younger men will be made public. That will be an incredible resource when it is. Right now all we have are the index showing their service dates, but not much more than that (although they often confirm birth dates and show occupations before service.) 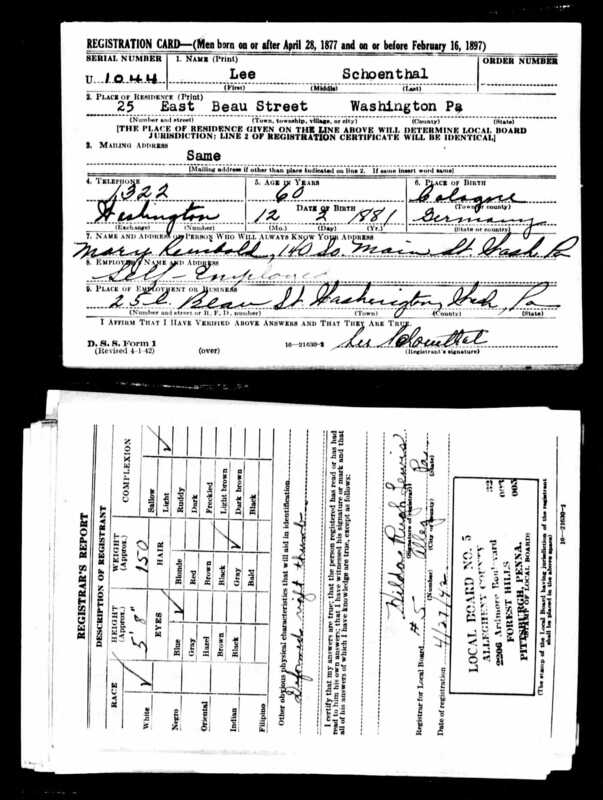 I love the Old Man draft cards for the information they contain, and so I hope someday soon the earlier draft records for World War II will be made public. Thanks, Cathy! Fascinating research. Makes the events of the War so real – and all the more heartbreaking. Great job once again, Amy. I, too, have been using registration cards for information, and sometimes they are great; other times, they are not so great. I thought I’d solved an unsolvable piece of our puzzle over the spelling of an ancestor’s middle name on one such card; it did the opposite by creating another possibility. Your research is fascinating, and heart-breaking as well. Thank you, Karen. I like to think that since these cards appear to have been filled out by the person registering as opposed to a third party like census records or even death certificates that they will be more accurate. But not necessarily so! It sure is—and much more fun than working! So heartbreaking to read the account of the deaths in the newspaper. Even though you knew it, seeing it in print sure makes it real. That one really got to me. Oh! That notice in the Aufbau, so heartbreaking! Yes. And placed in context with all the other similar notices in that paper, it is just horrifying. I am still shocked by the enormity of death and loss – the violence of the Holocaust. The pain of trying to locate family members after the fact and understand what happened is just another layer of the horror. And yet the hatred and violence continue, as this morning’s news indicates. Just what I was thinking. It’s terrible what we humans do to each other. What town was Arnold Haas from in Darmstadt? My Haas family comes from there. They were from Bürgel Offenbach, am Main in Darmstadt. The name is common though. I am not sure. I will have to look more closely. I’ll let you know! Wendy, he was born in Darmstadt (the town) itself. I have his birth record and other records that reflect that. I will send them to you. His parents were Siegfried Haas and Anna Mayer.